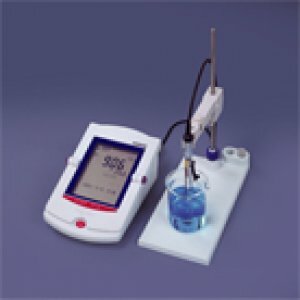 The R-Series Benchtop Conductivity Meters. Simply ahead of its time! The new R series Conductivity meters are designed for high performance with easy operation along with 2 models to choose from depending upon your requirements. Measure Conductivity, Resistivity, Salinity, Concentration, and Temperature with option for ambient temperature and humidity. The DKK-TOA exclusive calibration memory function. Intelligent Sensor "Calibration Memory" - The electrode stores 3 sets of calibration data in a microchip of the electrode including calibration date, sensor type, ID #, etc.. The information is downloaded to the meter when attached. Always a documented electrode with complete paper trail. GLP Compliant- Compatible with electronic recording and electronig signature regulations under 21 CFR Part 11. Password protection and enhanced printing functions. User restricted access. Calibration data storage function (20 historical sets of data), including sensor ID, cal data, zero potential and slope. Sensor replacement function and alarm indications. Diagnostic messages are displayed when an error indication is found. Easy to read and use menu driven operation, back lit large LCD display. Ambient temperature and humidity logging available. Data storage function- up to 300 sets of measured data can be stored in memory. System expandability)- optional peripherals can be added such as turn tables (12,18, or 36 samples) and electrode selector (max 5 electrodes). 2 Models for conductivity are available depending upon the options and accuracy that are required. The CM-30R is the standard version compatible with GLP / CFR part 11 regulations or for those requiring a Conductivity meter witht the high end features and automation capabilities. Perform a concentration calculation, interface a turntable for automation, connect to a LAN, etc. The CM-25R is the simplified version for those requiring a basic Conductivity meter without the high end features and automation capabilities. Also consider the R-series pH Meters and the Mutli-Function Meter for pH. ORP, Ion, Conductivity, and dissolved Oxygen measurement. All in one instrument! CM-30R Conductivity Meter w/Standard Accessories. R-LOG USB/LAN data collection software for PC to CSV format. AC-1V (HM-30R, CM-30R. MM-60R) Control Box allows for upper and lower pH limits to be controlled by 100 V relay for reagent pump/pH control..
OGC00002 RS-232 Conection Cable, 2m. EC-1G (CM-25R, CM-30R, MM-60R) Electrical Conductivity Check test plug. TC-1G (HM, CM, or MM R-series) Temperature Checker test plug. Additional electode holders, connection cables, extensions, beakers, and accessories also available. Flow Thru type EC: 10mS/m to 100S/m (100uS/cm to 1ms/cm), 0-100C., Cell const. 2000E10-1m, Cell volume is 1ml. Built in temp. Calibration Memory function. Note: a rubber syringe septum or pump tube is required. Immersion type for CM-20J EC: 100uS/m to 10S/m (1uS/cm to 100ms/cm), 0-100C., Cell const. 100E10-1m, Min. 4ml sample volume. Diam 14mmx26mm. Immersion type for CM-20J EC: 5uS/m to 1S/m (0.05uS/cm to 10ms/cm), 0-100C., Cell const. 10E10-1m, Min. 6ml sample volume. Diam 14mmx42mm. Immersion type for CM-20J EC: 1mS/m to 100S/m (10uS/cm to 1S/cm), 0-100C., Cell const. 1000E10-1m, Min. 39ml sample volume. Diam 36mmx38mm. The CM-20J Conductivity Meter is the Analog version for those requiring a simple and practical analog display meter. Operation is on AC or DC power incorporating a simple to use LCD display, with SI International and Standard convention units. (S/m and S/cm).